This topic contains 16 replies, has 9 voices, and was last updated by Radargirl 2 years, 8 months ago. I know where some of the stores and cafes were located and what they are today. If you have any old photographs of the monument either inside or out, or if you know of other store locations and what they are today – please let me know. I have one photo of a Monument Creamery Shop. I’m not sure where this one is and when the photo was taken. But if anyone recognises the building I would be delighted to know. 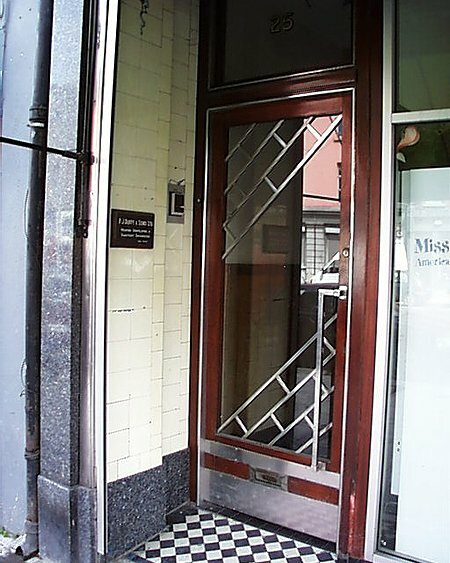 Somewhere in the back of my mind – not sure if its playing tricks – but I seem to recall a door like the Camden Street remnant along the retail units under the GPO on Henry Street – but it’s one of those memories that’s down a long corridor in a scary empty hotel in the Rockies. There is a whole ensemble of mahogany + stainless-steel screens and doors in the ward called ‘Top Flat’ on the 3rd floor of Temple Street Childrens Hospital, or there used to be. Love the diagonal brickwork pattern on the glazing, see alot of this brickwork on 30/50s (?) buildings. Gunter: it’s still there, as of last week; the middle child had a lung infection, full recovered now thankfully, I’ve been annoyed at myself since for not talking photos though at the time it was the last thing in my mind. I did make a valiant effort to photograph the room called “parlour” on the way out but got stopped by some sort of consultant. Hope this helps. Do you have a connection to them ? I’m just curious. Now I’m staring to imagine seeing those doors everywhere on the list but I’m not that old so it’s probably in my head. I lived over no. 57 Ranelagh for twelve years until 1970! I remember the shop when it was still in operation. I used to peep through the keyhole of the door in our hallway leading into the room where all the cheeses were stored and listen to the girls chatting. It was fascinating. When it went into liquidation it was taken over by a ladies clothes shop called ‘Rosaleens’. Sadly it has been empty for many many years and the whole building seems to be in a bad state of repair. I’ve always wondered why another business never took over? If you look through the letterbox of the shop you can still see a beautiful stained glass door with the ‘Monument Ceameries’ logo on it :o. If anyone has a pic of no. 57 I’d love one. We never got to take a photo during our time there. I think I know the previous occupants, I’ll enquire as to whether they have a photo. I’m also interested in the Monument Creameries. I have a list of what I believe is all the branches – some confusion arises between retail, cafe, bakery & storage depots etc. as there are instances of locations where the addresses are similar/close by but seem to be genuine. For example: “The Gaiety Corner, 52 Grafton St.” where a sale of liqueurs prompted an attempted prosecution for selling alcohol without a license! This address is the third I have for Grafton St. – No. 37 was a “Creamery’ (branch), and No. 39 was a Cafe. The business also had a connection with No. 38, but it may have been an investment property rather than part of the Monument Creameries business itself. Until the liqueurs incident, I hadn’t heard about that branch, though it must have been a high profile location. To the anonymous commentator who said they have a photo of the Parnell St. shop – I’d love to see it, please respond if you see this post! Finding stuff from the “pre-information age” is a slow process! So any information about the Ryan family or the business would be gratefully received. For example, I believe Andrew Devane, (the D in RKD architect firm) is Kathleen Ryan’s brother-in-law. I am Kapil singhal and i am a Dentist. I am not sure if this forum is still active, but I am also interested in the Monument Creameries as I am the great grand-daughter of the founders. I would be interested in speaking to others who have knowledge about the shops and cafes.